From the Mammal Society's publication 'Mammal News'. Eleven years after its inception, the Kent Mammal Group is still going strong, with over 100 members, a healthy bank balance and a fistful of ambitious projects on the go. Of the founding committee, three are still extant, including, Ken West, whose brainchild the KMG is. Ken, who has also been involved with the Mammal Society and the County Wildlife Trust, is now the Group’s President. With such an active group, the role of Chair is very demanding. For the last three years the group has been lucky to have the youth and energy of Jon Bramley at the helm. However, he will be stepping down all too soon in order devote the same vigour and expertise to the committee of the national body, as the liaison between the Mammal Society and local groups. As Kent is one of the few counties in which the enigmatic and charming Dormouse is faring well, you would expect it to be the focus of attention for any self-respecting mammal group. In fact it is the Group’s logo. Not surprising, when you consider that the KMG has placed at least 70 dormouse nest-boxes in 70 woods throughout the county (more than any other) and trained their attendant monitors. But the Group’s endeavours on the Dormouse’s behalf don’t finish there. Currently a grant from the BBC is enabling the KMG to extend its monitoring coverage still further by selecting 10 potential new sites in unexplored parts of the county and to fund the training programme necessary to maintain a large group of monitors. In addition, sites in a variety of habitats are in the process of being identified for the use of nest tubes, and a monitoring project is in development. Perhaps it is karma, but sales of dormouse nest-boxes generate a major part of the Kent Mammal Group’s income. Recording and monitoring must be the cornerstones of any county group. Without these there can be no conservation. Consequently, since 2004, Hazel Ryan has trained over 200 people and co-ordinates the county wide mammal survey which will lead, by 2015, to the production of the county Mammal Atlas. This is a challenge akin to painting the Forth Bridge, and of course must continue for the lifetime of the Kent Mammal Group. Having a Biological Record Centre in Kent means that there is a reservoir for all records to date, stretching back over many years, encompassing a vast amount of data in want of analysis. Something else for the future. Education and training generate ripples that spread out well beyond their initial point of contact. Enthusing and informing people wins mammals friends (and attracts membership to the group) at a time when many species and their habitats are under increasing threat, raises awareness and ‘passes it on’. 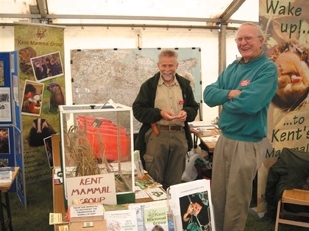 With that in mind the KMG has been always been well represented at high profile public events, such as the Kent County Show, ‘The Living Land Fair’, ‘Kent Goes Wild’ and many others. Thanks to Awards for All, from whom they have twice received funds, KMG have been able to purchase traps, display boards and other equipment for shows, design and print a brochure, carry out a survey for small mammals on the Isle of Sheppey as well as a number of other projects. In addition, the Group has two dedicated Youth Education Officers, experienced in engaging with young people, who stage and attend smaller scale events and visit groups and schools to give talks and demonstrations, wherever possible, throughout the year. The group’s committee has steadily gained a reputation for its expertise, with specialists in marine mammals (useful for a county with around 350 miles of coastline and sea on three ‘sides’), dormice, harvest mice, hares, water shrews and water voles. Mammals in Kent now have a voice and the Kent Mammal Group is included in all consultations from the County Wildlife Trust, County Council and Borough Local BAPs, for example. Over the years, KMG have organised a number of conferences, reflecting key species, such as the water vole and dormouse and conservation issues such as re-introductions. These have been held at a variety of venues throughout the county and have all been well attended. Some have been shared with the Surrey and Essex Mammal Groups, giving a regional flavour. Mammals are no respecters of county boundaries after all. That’s the committee, but what about the ordinary membership, the lifeblood of any group? Throughout the year, with a break for those summer months when the population is dispersed, the Group provides a regular programme of expert speakers open to all, including non-members, if they wish. Witness the sell-out when Pat Morris came to talk on Hedgehogs or Paul Bright on Dormice, for instance. Highlights among other speakers include; Martin Goulding on Wild Boar; Callum Rankin, then C.E.O. of The Mammal Society, speaking about the Society and its future events; Roger Trout of the Forestry Commission talking on dormice and Dave Williams of the Surrey Wildlife Trust on Badgers. However, there is also an annual members night when any of the membership can contribute and several speakers inform us of their personal studies, projects and mammal encounters. This means that within Kent, amateurs and professionals alike continue to be well informed across the broad field of mammals. When placed alongside the variety of training that is available through the Group, Kent’s mammals and the issues affecting them are given the highest possible profile from what is, after all, a relatively small body of people.